It’s a small cafe, tucked away off a main street. There is a steady bustle of people walking past on their way to other places. Inside is a small counter to order your drink, maybe something to eat. A handful of tables and chairs, all old wood, looking like they have been used for years and been in places other than this. One thing you notice is that all the tables are large enough for a sheet of letter paper to be placed down and for words to be written upon it, with a warming cup of coffee by your side. Paper and envelopes, all detailed with the name of the cafe are available at every table. Postage can be ordered with your coffee and food. Regulars can have their own box to which letters can be sent, the walls display messages sent generally to the cafe itself. Stories from around the world as people who have visited briefly decide to share their current adventure with the place itself. Each table itself has an ongoing letter, one that never leaves the table. People come and add their story and thoughts to the letter, addressing the people who have been their previously or those yet to come. These letters are in fact all over the cafe, the walls, the chairs. Stories can be told to everything in the cafe. They are like Kerouac’s long roll of paper recording his road trip only the travelling is not done by the storyteller for the journal, it is about those that move towards the object and what they set down in words at that time. The objects record those that use it, rather than the travelling experience of the individual. Letters arrive and are sent, private and public messages to share and those to cherish. Letters official or random, some make sense whilst others more like a narrative fragment from elsewhere. Some letters are bequeathed to the archive, to become as much a part of the narrative of the cafe. Others remain forever part of other stories, personal stories to be told to a different audience. The cafe exists for those who want to sit down and write their thoughts, their dreams. Their criticisms and imaginings. The stories to share with loved ones, the letter to the editor or just a missive in a bottle. It is a destination for letters and a distribution hub, a nodal point in a world of communication. A place to think, to watch, to talk. I’m going to geekGreen are you? 2008 looks set to have some amazing conferences, places where some wild and truly worldchanging ideas will be swapped and discussed. In no particular order we have the Oreilly conferences, Emerging Technology and Where2.0 (together with a raft of more focused conferences that are equally stimulating, such as Tools Of Change). SXSW is once again happening, and rising from the ashes that was Emerging Telephony Conference, we have the Emerging Communications conference, organised by a totally new team. That is just in the first half of the year. At the beginning of the year TED takes place again with an exciting line up of eclectic and interesting speakers and participants. I happen to love conferences, I find them stimulating and inspiring. They are a great place to make new contacts and for small half formed ideas to blossom into projects worth pursuing. They also take you out of your normal environment. Where ever it is you work, taking time out to talk to others whom you would not normally meet up with is always worthwhile. The only problem is that there is so much to attend, and time and finances mean that you have to focus your attention on a small slice of the discussion. Luckily though, many of these conferences share the talks online and of course they are usually well attended by bloggers. This coming year I do not think I will be attending any of these conferences, much as I would love to. I am not speaking at any of them (I have spoken at some in the past on public engagement and design ideas) and as so many take place in the USA unless I was to become a professional conference attendee and was able to stay stateside for a month or two attending them all, I would feel that the journey was not a correct thing to do in terms of carbon footprint. Then an alternative idea came to me, or rather resurfaced as I have spoken about this idea in one form or another before on the GeoWanking mailing list. How about I arrange my own conference, its not an unknown thing to do. Russell Davies recently organised Interesting2007, his London, affordable TED because he wanted to get that eclectic exciting feel that he got from TED but in a way that he could share with those who could not usually afford to go there. I missed Interesting2007 as I only found out about it after all the tickets had gone but it did sound truly interesting, a festival of ideas. The last conference I attended was Flash On The Beach, a Flash developers conference, held in Brighton. This was in its second year its organiser pulling it together as he missed the fact that there had been no European, independent Flash Conference for years. Flash Forward has been held in the USA twice a year for the last few years but had not ventured across the atlantic for at least the last 4 or 5 years. Though I had problems with some of this years conference it was still very inspiring and full of ideas. Of course there has also been the Unconferences, BarCamps, meetings arranged and the smaller conferences such as the ‘World Summit on Free Information Infrastructure’ or the Open Knowledge Foundation’s OKCon: The Annual Open Knowledge Conference. Then years ago I was involved with a ‘group’ called the Association of Autonomous Astronauts. A group of us organised Space 1999: Ten Days Which Shook The Universe which included a small two day conference held in the University Of Westminster. The gist of this is yes, I could do this (I am telling myself that). Since this post is on geeKyoto any theme would be related to the topic of climate change, sustainability and other technical and green issues. So I would like to ‘announce’ geekGreen2008. Announce in the sense that here is an idea, here are my thoughts on what such a conference could be. geekGreen2008 – radical ideas and stories in the time of climate change. Venue: Well to be decided and has lots of dependancies but it is going to be UK based, at least for the first (only?) one. My initial take was for London. Interesting2007 was held at the Conway Hall in Holborn. The main theatre can hold 300 people and it has a nice stage. It also has an interesting history. Where else? Well RIBA has been suggested as has the ICA, and maybe somewhere like the BFI on the South Bank has some interesting spaces. In fact the South Bank would be interesting because Cape Farewell are currently in residence there and Cape Farewell is a project that I would love to see a part of this. Outside of London though still has possibilities. Of course the ideal location would be the Eden Project in Cornwall, though somewhere like the Centre for Alternative Technology would also be a possibility. When: Mid year? It is almost Christmas 2007 as I write this so nothing will really happen until January 2008. I would want this to be a success and get some of the best most interesting speakers, the best sponsors I can interest and the most interesting projects. To be realistic if this happens it will not happen until the middle of 2008. Still that means if anyone wants to go to this as well as all those other conferences I mentioned at the beginning they will have plenty of opportunity. How much: As cheap as we can make it. I want to be able to get the people who could not afford to get to TED, ETCon and the others. That means conference tickets that are not in the thousands of pounds. Whilst I hope that businesses would want to take part I doubt that many would feel that this is (yet) part of their core business and would not write off tickets for employees that cost too much. That said we would want to balance what you get for your ticket. Hopefully we will still be able to put on one of the most exciting conferences outside of TED (this is all from word of mouth, I am yet to attend this conference). One idea here though is the idea of the book club, or media club. You buy your ticket and that also supplies you with a series of books (or other media materials) in either preparation for the conference or post conference to carry on the ideas. Of course a project like this increases the costs and what if the material is already in easily available distribution? It would be likely, possible that you already own the relevant books or at least many of then. Still it is an idea (The Global Business Network ran a book club that supplied its members with the latest, most relevant books) that I think is worth investigating. Now on to the speakers, for this I was thinking that we would only have one stage, so only the single strand. Whilst multi stranded conferences pack much more in you are left with having to pick and choose. I want to be able to let you sit back and listen and watch and learn and be amazed. I want you to watch something that given the choice you might not have bothered with. Who will speak, well at the moment no one but I do have a wish list. I want artists and scientists, technical wizards and crafters, storytellers and statisticians. Anyone who can present a through provoking idea within the framework. That framework, well I was thinking that presentations would be between 15 and 30 minutes long, depending on the material. If anyone really needed more then I am sure it could be arranged though. How long would the conference last? Well I have a gut feeling that two days of presentations, from morning to early evening would dazzle people with ideas. If we have space for people to carry on the discussions into the evenings so much the better. What would also be wonderful would be a final day that was more an unconference. This space would be open to all participants in the conference, if they felt that they have an idea that they want to throw into the mix then grab a spot on the third day. People who are not scheduled speakers would have a priority. This day would also be open to those who had not attended the previous two days, would be free to get in to and would still be recorded and made available online. Oh yes, everything should be online as soon as possible after the conference, the idea is to get ideas out there and acted upon or at least new ideas stimulated and acted upon (acting very soon is getting to be very important). Sponsorship and Schwag: Yes we would want sponsors, otherwise the ticket cost will be too high. Well there may be ways to avoid a lot of costs and still have a productive stimulating conference. Ideally we want sponsors who are willing to sponsor the infrastructure, getting the net into the venue and distributed to all participants, streaming of talks (maybe, it would be good to be as inclusive of those who cannot make the actual physical venue as possible). These are sponsors of the Apple, Google ilk. They can make it happen but they would have to see the benefit for them. I do not think it would be hard for them to see such a benefit but I do not want people giving out promotional pieces of paper or pointless trinkets with logos on them. If this is to be a conference on surviving the great changes that are happening on our planet then such things should not be considered. Maybe say, if the likes of Amazon sponsored the book club for each participant then each book could carry an message on the inside cover as to who supplied the book? Maybe they can use their existing infrastructure to deliver the books (of course they can) thus making sure that the Amazon name is out there. Of course this would be much easier to sell into such companies with an established conference, TED has a reputation and an audience that is well understood. I want to say that we can create a conference for people who can have as much impact as many of them but they need a venue for the ideas to start and to continue. To the sponsors this will be as vibrant and creative an audience as the other conferences. Finally in the land of Schwag, no bags! I do not need a new laptop bag. I attend a conference and get a bag. Oreilly give out tote bags, lightweight and useful to throw a pen, some paper and the schedule in. A lot of other conferences you go to and there you go, a new laptop bag, embroidered or screen printed with the conference logo and date. Within minutes you are milling in a sea of the same bags over shoulders. Apart from the fact that these bags are not the highest quality (my crumpler bag is much nicer) it is another waste of resources. My thoughts here are, no bag but you will get a nice (hopefully very nice) embroidered badge with the conference logo on it. You can then decorate your own laptop bag with it (a nice craft workshop in the early evening with a load of people sewing badges onto their bags or jackets, somehow appeals to me). In fact WSFII had something similar, they had a screen printed patch and there was a space where you could go and get a few tips on attaching the patch to, well whatever you wanted. This allowed for creativity, a reduction in the nightmare sea of ‘is that my bag or your bag’ and in fact makes a much nicer souvenir of the event. Imagine attending a conference and seeing a patch or badge from one you recognise on someone else’s bag. This could be the trigger for a conversation, a discussion on the older conference versus where you are now. So no bags, but badges yes. I have skipped over the speakers haven’t I? In my vision of a line up we would have the following, in reality? Well I would hope that we would be able to get a few of them but what would be important would be the new and exciting voices that we have not heard before on the conference circuit. In fact, finding them will be the real challenge to make such a conference a success. * Bruce Sterling. Yes I realise that he is no stranger to the conference circuit but his fiction work has been a part of my life since it started being written and whilst in the last couple of years he has been known more for his work about design and objects and data (spimes) it is his Viridian Design Movement that has inspired geeKyoto and much of my thinking over the last few years. He is visionary, to hear him speak is a wonder. If you listened to his SXSW keynote from a few years back where he ended with a poem that could not help but move you. Even if he is not at a geekGreen event in person, I would hope that he was in spirit. * Brenda Laurel. Her book ‘Utopian Entrepreneur’ is to me now a small bible of sorts, re reading it inspires when I reach an impasse. Her work on virtual reality and interaction is still vital and interesting but it was this tale of doing what she felt was right for her and in turn the society in which she was a part. * James Lovelock. This is not a conference to debate if climate change is happening or even if it is human endeavour that is causing it. I believe that both of these are true statements. What interests me is what we need to be doing about it and James Lovelock, the originator of the Gaia idea is key to this. His most recent book ‘The Revenge of Gaia’ is a warning of the disasters that await us through inaction and this inaction would also cause disaster even if human action was not playing a part in the cause of climate change. Strong in his belief in his ideas and with the scientific understanding and rigour to back them up James Lovelock would be vital participant in geekGreen. * Christian Nold is an artist who has been travelling the world and showing us our environments from a new perspective, that of emotional response. His work is both exciting and new, it crosses many boundaries and can have an impact across many disciplines yet for Christian his art is important. * The Long Now Foundation’s aim is to make us think long term something we do not do either as individuals or institutionally. Climate change is here for the long haul, its effects will be long term and we need to be able to visualise and think in terms like that as well as the short term. A whole new skill set is needed and it is the Foundations aim to foster such thinking. * DIY Kyoto are a small company who recently produced the Wattson. A tool for visualising the use of electrical energy in your home. * Dopplr is a new website about travel. That you can see when you are going to be in the same place as many of your contacts, friends and fellow travellers leads to serendipity. They are investigating ways of making the travellers carbon footprint more obvious and to see if this tool can help to manage the travel style of the global citizens. * AMEE is a web service that is designed to give a consistent understanding of your carbon footprint. It encodes all the government standards and data and makes it available via an API so that your footprint applications will be consistent with others. JG Ballard, William Gibson, Jack Womack, Bruce Sterling, Carl Sagan, Cosmos, Mike Davies, Naomi Klein, Iain Sinclair, George Monbiot, Andy Goldsworthy, Neil Gershenfeld, Jane Jacobs, Stewart Brand, Peter Kennard, Adam Curtis, Derren Brown, Richard Dawkins, James Lovelock, Buckminster Fuller, Walter Segal, Ansel Adams, Peter Akroyd, Brenda Laurel, Jared Diamond, Ken Macleod, John Gray, The Long Now Foundation, WorldChanging, Martin Dodge, Brian Aldiss, Patrick Moore, Heather Cooper, Barbara Hepworth Edward Tufte, BLDBLOG, BoingBoing, all the speakers at all the conferences I have attended and watched over the internet and many many more. If you think that you would be interested in geekGreen2008 or if you know someone who might be interesting to speak at such an event then please let me know. If you know of anyone else who might be interested then please pass on the link to this post. If the interest is there then I will arrange it. But it won an Oscar. An Inconvenient Truth is an interesting film, a documentary that is a presentation. The ideas that it communicates are vital, climate change is happening, we are almost definitley to blame. Part of me though feels that this is somewhere we have been before, a documentary that everyone has to see, it will change the world. Yet fahrenheit 911 didn’t change the election. The world was not made a ‘safer’ place. Do not get me wrong, I am not wanting to be seen as dissmissing either film. Both are strong films, each has the strength of their own conviction. Michael Moore’s film is just that, a Michael Moore film one that has his personality and his view of events embedded in it. AIT is more reasoned. It has the backing that only science can give. The data cannot be refuted, what is presented in this film is what is happening. BUT, is it just a cheesy powerpoint ? (ok, I know that Al Gore sits on the board at Apple so it is not a powerpoint presentation but a Keynote one). Has anyone yet done a critique of the film, of the presentation taking Edward Tuftes ‘THE COGNITIVE STYLE OF POWERPOINT: PITCHING OUT CORRUPTS WITHIN‘ as a guide to what is wrong with presentations built using tools like power point? I have just got back from a presentation at the Regent Street Apple Store. The presentation was by geographer Ned Gardiner and animator Arlene Ducao from the American Museum of Natural History’s Science Bulletins programme. The presentation was about the visualisations they produce for the Museum. 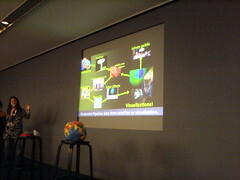 These visualisations are used in the Museum, are syndicated across the USA to other museums, used by scientists are are available from the website http://sciencebulletins.amnh.org . They showed three visualisations on Stratospheric Ozone, Sea Ice and Urban Sprawl. These are based on scientific data from Earth Observatory System satellites. The one on Urban Sprawl also used survey data. Inbetween each of these visualisations, presented by Ned, Arlene demonstrated how she worked on creating these visualisations from the scientific data. She used Maya and After Effects. 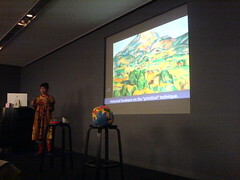 Arlene talks about “primitive” technique – Cezanne and Cubism, George Boole and boolean algebra. Why do they create visualisations, rather than just use photographs or other media. The High Definition renderings of the visualisations are distributed to other museums across the states as part of a subscription service. They download new movies on a weekly basis. Satellite vantage points and designs provide different measurements. 20 – 30 years ago, earth / planetary science visualisation was done using colour by number techniques, now we can produce complex animated visualisations of what is happening to the earths ecosphere on your desktop. These visualisations are a vital tool for the geeKyoto project, they help convey the complex science behind climate science and planetary science, developed by people who specialise in producing educational material. Information on the data sources used in producing the visualisations is given, so you can try and make your own and you can answer questions on the sources if asked. After the presentation I introduced the geeKyoto project to Arlene and also the concept of the Daily Climate Report, so hopefully we will hear more from the American Museum of Natural History and the team there producing this excellent work. yesterday (14th February 2007) i was lucky enough to attend the 3rd Design Futures conference, held by the BBC’s Design Forum. yes it is for BBC staff only but the ideas are so important that they need to be spoken about elsewhere. the day had 5 world class speakers, one of whom was John Thackara, of ‘In The Bubble‘ and ‘Doors of Perception‘ fame. His talk was about content, an underlying theme of the day. His focus was content in the face of global, catastrophic climate change. by starting with a distillation of Al Gore’s presentation to four slides he then went on to present some of the work that is happening in DOTT07, or Designs of the Time. this is happening in the north east of england and is looking at design and everyday life, in the context of climate change. he then gave four ideas that he felt that the BBC could help build and communicate. all four are good and important and i can see ideas for all of them but at the moment i want to concentrate on one which i feel is visibly most appropiate for the geeKyoto project. on prime time television, every day we have meteorologists present what is essentially a jargon ladden, scientific based prediction and report on the current and expected weather. most people watch it and note the graphic over their area, the rain or the sun maybe paying attention to the time as well. does anybody really understand what they mean by the bands of high (or low) pressure and why it affects the weather over their heads? so the challenge is can we present the state and predictions of the climate, globally and locally. all the science and politicians state that it is going to get worse before it gets better and if we do not do anything it will just get worse. can the BBC do this? well yes i think it can but so could geeKyoto, could we make a ‘the daily climate’ meaningful and easy to understand in as ambient and easy a way as possible? how do you start building a presentation to explain what is going on? how do you tell people, who might not want to hear that they will have to change how they live, that they will have to change to survive? it is no easy task, though nothing of import is ever easy. in the news now we all hear that climate change is happening and that we have caused it. unless people are told how to chnage though, they will just assume that the politicians and big business will save the day. do we start with the earth, seen from space with clouds our blue marble or do we start with a pale blue dot viewed through the rings of saturn? or maybe we start with a picture of our homes, the places where we live, the places where we as individuals have to make a difference. a lot of us have to start telling the story and doing the story, not everything will be big and world changing mostly it will be small, local but always important.